Area residents are encouraged to sign-up to donate blood at our upcoming Blood Drive to be held at 11032 W Lincoln Hwy in Frankfort on Wednesday August 8th from 3:30-7:30pm. 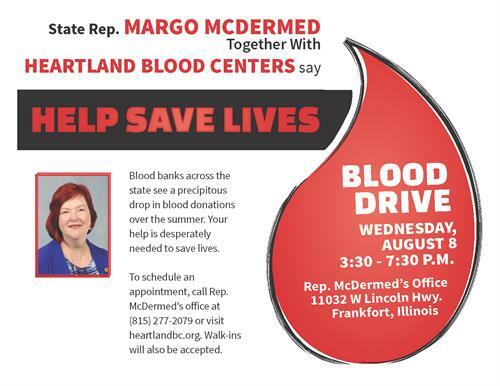 This is the 4th annual blood drive sponsored by State Rep. Margo McDermed (R-Mokena) in conjunction with Heartland Blood Centers. Those interested in donating blood should call Rep. McDermed’s office to schedule an appointment at (815) 277-2079 or visit heartlandbc.org. (815) 277-2079 or visit heartlandbc.org.